I have kept this picture of Trooper on my desktop since it was first sent to me a month or so ago. I fell in love with his face – doesn’t he look like one of the Whos from Whoville? His past was a very sad story indeed, but despite how terribly he was treated this sweet dog could still look you in the eye and smile that beautiful smile. Trooper, who luckily found his way to the Good Samaritan Pet Center in Denver, was adopted by the people who were fostering him. They just couldn’t give him up – can you blame them? 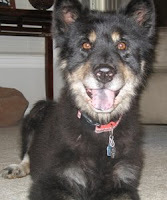 May you live many happy years, Trooper, in the loving care of your new forever family. 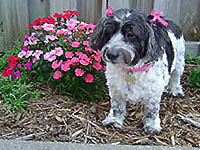 Then there is Suki, the beautiful Labradoodle who shares her life with my friend Debbie Knitz. I took one look at Suki’s face and couldn’t stop smiling. I understand why Debbie loves her so. I was so inspired by these photos I decided to create a HO HO HO picture of my own special kitties. They all put their tails in the air and walked away. To all the animal lovers out there – a very joyous and happy holiday to you and your critters! Chris, These are some great pictures! I’m so glad Trooper found his “forever” home and Suki is absolutely gorgeous. She looks like she enjoys the snow as much as my little miniature poodle, Blazer, does. Now, my kitty, Kimber, hates the snow, so he’s been sleeping on the bed for most of the last two weeks. Last, I checked, he is breathing. Hahaha! P.S. Aren’t you glad it’s starting to warm up some? Maybe this snow WILL melt by April!